Red light running (RLR) is a problem in the US that has resulted in 165,000 injuries and 907 fatalities annually. In Iowa, RLR-related crashes make up 24.5 percent of all crashes and account for 31.7 percent of fatal and major injury crashes at signalized intersections. RLR crashes are a safety concern due to the increased likelihood of injury compared to other types of crashes. One tool used to combat red light running is automated enforcement in the form of RLR cameras. Automated enforcement, while effective, is often controversial. 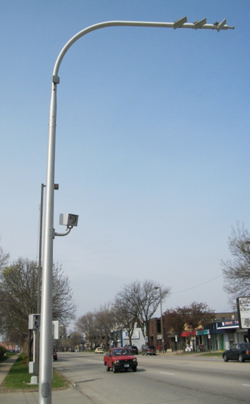 Cedar Rapids, Iowa installed RLR and speeding cameras at seven intersections across the city. The intersections were chosen based on crash rates and whether cameras could feasibly be placed at the intersection approaches. The cameras were placed starting in February 2010 with the last one becoming operational in December 2010. An analysis of the effect of the cameras on safety at these intersections was determined prudent in helping to justify the installation and effectiveness of the cameras.